Wrought iron heats faster than cast iron. Though cooks and seasons like cast iron! Is it really 'wrought' iron? A common question. As we’re mechanical engineers, and we know iron (and it’s many forms and compositions), and we know how to work this iron into the shape of a finished pan (wrought). This makes a seamless rivetless pan WITHOUT casting, in a patented world-first process. This is iron and it is wrought. Presuming it is untested? The Australian versions of these pans are already legendary among top chefs and a #1 seller in Australia for their superior performance over cast iron and carbon steel: www.solidteknics.com/testify . We’ve started production in Chicago with US wrought iron because demand from US cooks was growing rapidly. Shouldn’t a new US manufacturing of a new wrought iron pan be something you’re proud of? It would take trying the pan, then redefining old ideas of wrought iron. But times change, sometimes for the better. These new pans are a very good example. Why wrought iron and not Cast iron has worked fine for hundreds of years. It is true cast iron has been fine for a very long time, and we love cast iron, in a nostalgic old way. Cast iron is however becoming obsolete, wrought iron does everything better in terms of what is important in an iron pan. Pro chefs have never used cast iron as their working skillets. 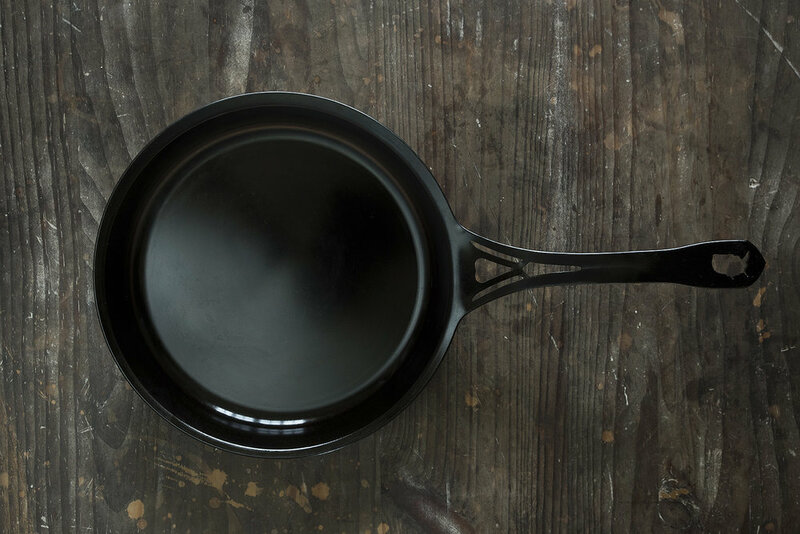 Chefs all around the world use our wrought iron pans all day long as their working skillets. They simply can not use cast iron all day due to the weight. Our long comfortable vented handle stays much cooler than fat little cast handles…..
Wrought iron cooks and seasons like cast iron, it does however conduct heat better (faster and more even) than cast iron, and it will not crack like cast iron can. The big one: wrought iron is around half the weight of cast iron. For a short time we have a ‘Try Me’ special at a price never to be repeated for exactly this purpose: for $49 you can own a rare First Edition 7.5" pan and try the difference for yourself. Like our Australian pans when we first launched 3 years ago, everybody came back to collect the rest of the range, and stopped using their old Teflon and cast iron pans.